A Canadian university professor ignited controversy by refusing to use gender-neutral pronouns. Is he a villain or a victim? University of Toronto psychology professor Jordan Peterson had enough of what he saw as a campus culture where "social justice warrior, left-wing radical political activists" ran rampant. In September he released a video lecture series taking aim at political correctness. He zeroed in on Canadian human rights legislation that prohibits discrimination based on gender identity or expression. Dr Peterson was especially frustrated with being asked to use alternative pronouns as requested by trans students or staff, like the singular 'they' or 'ze' and 'zir', used by some as alternatives to 'she' or 'he'. In his opposition, he set off a political and cultural firestorm that shows no signs of abating. At a free speech rally mid-October, he was drowned out by a white noise machine. Pushing and shoving broke out in the crowd. He says the lock on his office door was glued shut. At the same time, the University of Toronto said it had received complaints of threats against trans people on campus. His employers have warned that, while they support his right to academic freedom and free speech, he could run afoul of the Ontario Human Rights code and his faculty responsibilities should he refuse to use alternative pronouns when requested. They also said they have received complaints from students and faculty that his comments are "unacceptable, emotionally disturbing and painful" and have urged him to stop repeating them. The university is also trying to organise a "civil and respectful" debate, which would include Dr Peterson, to discuss gender provisions in federal and provincial human rights legislation. Either way, Dr Peterson is not backing down. "I've studied authoritarianism for a very long time - for 40 years - and they're started by people's attempts to control the ideological and linguistic territory," he told the BBC. "There's no way I'm going to use words made up by people who are doing that - not a chance." Dr Peterson is concerned proposed federal human rights legislation "will elevate into hate speech" his refusal to use alternative pronouns. Bill C-16, currently before Canada's parliament, prohibits discrimination under the Canadian Human Rights Act on the basis of gender identity and expression. The bill covers the federal government and federally regulated industries like banks or airlines. It also extends hate speech provisions under Canada's criminal code to transgendered people. "I don't think any legal expert would say using an inappropriate pronoun, while not something that respects the human rights of trans people, would ever result in a criminal conviction," said Kyle Kirkup, a law professor with the University of Ottawa who specialises in gender identity and sexuality law. But Dr Peterson could face sanction under Ontario's human rights code, which extended protection to trans people in 2012. Penalties range from fines and damages to mandatory anti-discrimination training. Dr Peterson says he does not object to trans people or to choosing which traditional pronoun they prefer. "If the standard transsexual person wants to be regarded as he or she, my sense is I'll address you according to the part that you appear to be playing," he said. But he argues terms like "gender identity' and "gender expression" are too broad, are the "propositions of radical social constructionists," and are being used to bully opponents into submission. "There's only two alternatives to that," he said. "One is silent slavery with all the repression and resentment that that will generate, and the other is outright conflict. Free speech is not just another value. It's the foundation of Western civilization." 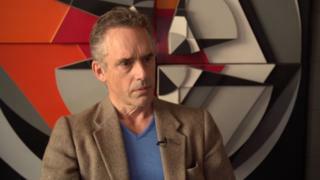 Dr Peterson's University of Toronto colleague, Dr Lee Airton, argues he is being alarmist and indulging in "slippery slope fallacies" on the limits of free speech. "If you actually listen and you parse out the arguments, it becomes very clear that this not about freedom of speech, that this is about reducing transgendered people's needs as excessive and illegitimate." Dr Airton, who personally asks to be referred to as 'they', recognises people can find alternative pronouns "very jarring", but says if both sides are open to being accommodating, in practice it becomes "no big deal". "This is not a freedom of speech debate. This is not a scandal," said Dr Airton. "This is people very publicly working through their own lack of familiarity or understanding of trans people's otherwise fairly ordinary lives."